I'm on a local parenting board - I found this group of gals when I was planning my wedding. We planned our weddings together via the local wedding chat board and now are having babies together and keep in contact via the local parenting board. They're a wonderful reason and several have become life long friends. One of the moms had a FANTASTIC idea! Instead of doing the iron on transfers that so many moms do for monthly photo ops, she does stickers! Talk about easy peasy! Instead of having to buy 12 separate onsies and ironing on the transfer, you simply take the stickers and apply to whichever onsies you want! That's so key for me right now. I have so little time, it seems, to simply put the thing on real quick before the photo instead of dragging out the iron is really key to me. And I don't mind saving money in having to buy 12 different onsies. I have some for Maddy and I love them! You may have noticed them in her two month love letter. They're sooooo easy! And, the photos we're getting are so much fun. I highly recommend them to anyone wanting to do monthly photo ops or as a shower gift. Being that I'm a purebred spud, I am always looking for things to do with my beloved potato. I'd been trying to figure out an easier way to have real (NO packaged potatoes for us, thankyouverymuch, that's sacrilegious for a girl from Idaho!!!) potatoes cooked/packaged/frozen for us to have on hand. My wicked stepmudder (She's not really wicked. In fact, I'm rather fond of her) sent me this video link of Maryann, from Gilligan's Island, showing a handy dandy quick potato trick. Before I sent it on, I had to try it myself....I *hate* when people send on stuff that hasn't been tried and tested (or snoped or smokinggunned for that matter...). So, today, while Miss M was napping (hello...her first good nap in DAYS), I gave it a shot. Much to my happiness, it REALLY WORKS!!! I'm going to use half of the potatoes I cooked for tonight's dinner. The other half I'm going to let cool then food saver and freeze! The next time I need some potatoes, I take them out of the freezer, snip the corner off the bag and boil. Voila...instant cooked and *real* potatoes! 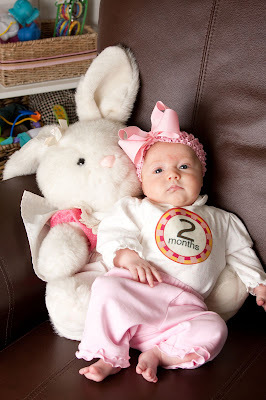 My dearest munchkin - you are TWO MONTHS OLD! Where did the time go? 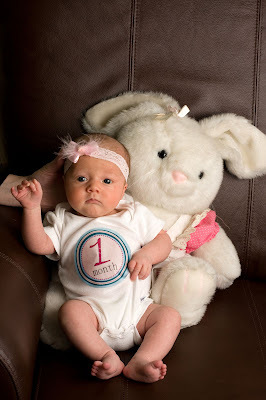 I can't believe you're already two whole months old! You had your two month check up with Dr. Fasullo today and you've grown almost two inches and you've gained two pounds, so you're 21.5 inches long and just about 10 pounds. This last month has been a busy month for you! Your Papa and Gigi came to visit you. They absolutely adore you and it was nice to have them here! While they were here, we showed them around our little neck of the woods, took them to Redondo Beach for your first glimpse of the sound. We took them over to Grandma Marilyn and Grandpa Ron's house and to Grandma Jody and Grandpa Jim's house. We all went out for dinner and you really enjoyed the "fine dining". Everyone thought you were beautiful! But mostly, we just hung around the house and they loved on you as much as humanly possible. We started visiting Auntie Jennifer more. I want you to be comfortable over there when I go back to work. I already know Auntie Jen is going to take wonderful care of you and you'll be just fine without me, but I like to think you'll miss me all day long and need to get used to everyone but me. It's a Mommy thing. While we were at Auntie Jen's, you got to meet Rachel and her two little boys Lucas and Josh. Rachel taught me how to use our Moby wrap better and that's been great! I've used it a lot more and you almost always fall asleep on my chest. Thus far, we've only tried two different ways of wrapping it, one with a cradle hold and one with your head on my chest. You like both of them! We went to the museum with Grammy Marilyn and my friend Jennifer. Her little boy Holden was born just a few days after you and you two seemed to enjoy each other's company. You weren't much interested in the art, but then again, you're only a few weeks old ;) You did very well on that outing and didn't fuss much at all. We had our first public restroom changing and I didn't drop you in the toilet, so I was really proud of myself. Someday you'll understand that - how hard it can be to keep everything from touching the ground or any unclean surfaces, all while holding an infant in your arms. I'm not yet a one handed pro - so it's still challenging for me. You also got to meet your future BFF Mikayla. You two really hit it off. When she cried, you cried. When you cried, she cried. She held your hand and petted you - it was really sweet. Mommy really loves Mikayla and her mommy Deborah, so she's glad you two are hitting it off. Hopefully you two will spend a lot of time together growing up. You're growing so big, it's astonishing. 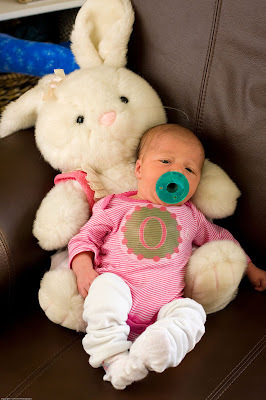 You're already so long, you're starting to outgrow your newborn clothes. Not because you're too big in the tummy, but because your legs are getting so long! You're really holding your head up well. Not without wobbling some, but it won't be long that you'll hold it up all the time! You're a master smiler. You really light up when you see someone you recognize. Thus far, that list includes Mommy, Daddy and your mobile. You still love that mobile something fierce. Daddy and I call them your "friends". Your monkey friend, your birdy friend and your froggy friend. You looove them. I've got videos of you watching them I'll show you some day. We're just starting to really play with toys with you. You don't hold on to anything just yet, but you're starting to smile when we shake your rattle. You love for us to hold you and put your feet on the ground so you can pretend like you're walking. In fact, you can stand on your legs and support your own weight pretty well. I think Daddy is right and you'll walk early. Mommy still hopes you don't. I want you to stay little for as long as possible. You still have the cutest cough I've ever heard and when you yawn, I melt....it's adorable. You've got a whole range of new noises. You definitely cry to let us know you do not like whatever is going on - which is usually me changing you (you hate that - you like to either be naked or dressed), a dirty diaper, a request for another bottle, or you're just plain tired. Lately you've started "talking" to us. You grunt and make cooing sorts of noises. You don't laugh yet...I can't wait for that, I know it will be the cutest thing ever. You and I have a night time routine. Some nights we take a bath. You like that, except for the getting dressed part. Then, we read the same three books every night: Guess How Much I Love You, Just In Case You Wonder, and Goodnight Moon. You usually take your last bottle while I read those to you. And more and more, you rest your hands on your bottle, as if you want to hold it. Little Miss Independent already. Then, we sing our nightly lullabies while we rock. Most of the time, you're asleep by the end of the lullabies and I take you to bed. You still sleep with us. If Daddy is home, I put you into your co-sleeper just so we all have enough room. But, if it's just you and me, I put you on Daddy's side. You'll stay asleep for maybe fifteen minutes then you wake up. You know I'll come get you and I usually put you in your swing while I finish up taking care of George, making milk for the next day, and tidying up. Then, we go to bed together. You still sleep best when you're right next to us. In fact, even when Daddy is home, you might start out in your co-sleeper, but you usually wake up fussy and end up in bed with us. I think we all enjoy that - even though Mommy wishes we had a king size bed instead of a queen size bed. In a few weeks, we're going to visit Nana and Gigi and Papa. We'll get to visit Auntie Bree and Uncle Drew and Cousin Carson. I'm very excited to take you to Idaho, even if I'm a little nervous about getting us both on the plane. You take a lot of stuff!! We've had some challenges this last few weeks too...you've been throwing up *alot* and your little bowels aren't doing what the should. So, we've had to put you on a special formula to see what you're allergic too. It's going to take us three or four weeks to figure things out and Dr. Fasullo, Mommy, and Daddy are still hoping it's a bug and that you'll be able to drink Mommy's milk again. I guess those bugs can take a long time to pass in little babies. But it seems more like you're allergic to milk. So be patient over the next couple weeks...we know you don't feel good and your tummy hurts you. We sure are doing everything we can to figure it out because it just breaks Mommy and Daddy's heart when you don't feel good. My littlest, I just can't believe you've been here for 58 days. In some ways, it seems like it was yesterday that you were born and in some weeks, I'm floored by how much you've grown in such a short time. You're getting so big so fast. It's exciting but makes me sad too...I hate to see you grow up too fast - you're so precious to me, I just want to be able to love on you and snuggle you tight for a really long time! I love you little Maddykins - with my whole heart and soul. I can't wait to see what you have in store for us in your next month. I come by my excessive worrying very, very naturally. My dad is a self admitted worry wart. He can worry with the best of them. He came by it naturally too - his dad was a champion worrier. Whether I had a great grandparent that taught my Grandpa to worry, I don't know...but I'd have to guess it's a learned trait - so the answer to that is probably yes. I've got a worry on my heart and I just can't stop thinking about it - so I thought I'd throw it out there for good energy or prayer, whatever your fancy. I know it's silly to worry about something when you don't have any answers, I know I just need to give it up to God and let go. But I worry - it's who I am...and I don't know how to do anything else right now. Madelyn still has that green poo going on. Yeah, I'm worrying about green poo. Welcome to motherhood. Other than that, she seems much better. However...she's still got that green poo going on and that isn't normal. When we were at the doctor last week, she mentioned The possibility that this was the sign of an allergy to milk protein, which she's getting through my breast milk. So, don't you know I googled that to read all about it. And aside from the green poo, she isn't exhibiting a ton of the symptoms. She isn't throwing up as much, she's not seeming as gassy, she's growing, thriving, no eczema that I can tell. She does get fussy in the evening, but most babies do - that's very, very normal from what I can tell. But that darn green poo - the only thing I can find on the Internet that this indicates is an allergy to milk protein. And the way to handle that? Either she goes on a very special formula or I go on a completely dairy free diet. Either solution does not really sit well with me. I hate pumping - Lord knows I do...but I do it because I know breast milk is best. But to go on a completely dairy free diet? Geeeeez...could breastfeeding get any more difficult for us? Not only to have to exclusively pump, which is no walk in the park....it's hard work....but to have to completely change the diet of the household? Common!!! Someone out there give me a break already! Pretty much every casserole (of which there are many left) in my freezer has dairy in it. Nearly everything we eat has some degree of dairy in it. I'd have to relearn how to cook, practically - new recipes, new thought patterns. And honestly, that might be more than I can take. And dang it, I worked *hard* to get the freezer stash of milk I've got for her. I've got almost 200 ounces frozen, waiting for when I go back to work. Any mommy who's pumped knows that's a lot of milk. That's 7 full days of food for her. To throw it out? That's like pumping my blood and then washing it down the drain. It makes me want to cry to think about it! And here's where my real worrying comes in....what if she doesn't outgrow it? I've had family members (well, only one that I know of) have a milk allergy. His was pretty severe and wasn't fun for he or his parents to deal with. I don't want my little girl to have to deal with that. I just want her to be able to be worry free and not be concerned that something someone feeds her is going to be harmful to her. Her two month (two month!!!) check up is on Monday and her doctor will follow up on our visit last week - so I should know more about what we might have to do then. Jim is able to go with me, I'm happy to say. It's always so much easier when we're both at the doctor's together. He thinks of questions I don't think of and it's good when we hear things at the same time instead of them being filtered through my brain. Thursday was a great day, which followed a not so great day. I'm now off work until May 22nd. YIPEEEEEEEEEEEEE!!!! I got word from my HR department that now, in the state of Washington, short term disability time (that you get when you have a baby) and FMLA (that you get when you bring a baby home, adopt a baby, need to care for an immediate family member or yourself) do not run concurrent - they must run separately. What does that mean for me? Previously my company (and I) thought they ran concurrently and I was due to return to work on April 6th. Now, I'll be off work until May 22nd. Usually she wakes up somewhere between 3 - 5 depending on when I was able to get her down wanting to eat and change. However, on Thursday, I was the one who woke up first, at 7:30!!!! I tried to give her a bottle and she didn't want any part of it. So, I let her go back to bed. This seemed a bit strange to me - so I called her doctor at 8. They agreed and we went in for a visit. The verdict was that it was either (a) a bug (b) the beginnings of colic (ohh, please no!) or (c) she might have an allergy to cow's protein and is reacting to it via my breast milk (ohhh, REALLY, please no!!). At any rate, we have her two month check up on Monday - so we'll be able to check back in with the doctor and see what she has to say after we monitor her for the weekend. Let's all pray bug....and be shocked that my littlest is going to be two whole months old next week. Today was Madelyn's first adventure into the world of culture. She, along with her Grandma Marilyn, and my friend Jennifer and her son Holden ventured down to the Seattle Art Museum. Jennifer and I met on the local parenting/pregnancy chat board I frequent and happened to be due one day apart (she on the 19th and I on the 20th). Unfortunately for Jennifer, Madelyn came a few days early and Holden decided to hold out (sorry - I couldn't resist the play on words) for several days, so they're a week apart. Aparently Madelyn likes younger men. First Ryan, now Holden. We started our day at The Olive Garden to partake in the Soup, Breadsticks, and Salad lunch. I do love me some Olive Garden Breadsticks...which I found were the easiest to eat because Madelyn was up the entire time and wanting her bottle. Holden, on the other slept like, well, a baby! I also had my first adventure in public restroom changing tables, which I'm proud to say I handled without any major mishaps. The baby did not fall off the table into the toilet and I managed to get her changed. We then met up at the museum. 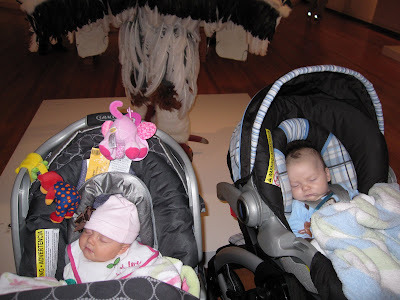 Holden and Madelyn weren't much interested in the exhibits....except for this one. They both seemed rather fussy and in need of a bottle when they got a look at this one. Jennifer and I agreed that this lady had obviously recently spent time with a Medela Pump In Style breast pump because they can't naturally look like that. The SAM has several displays that are always there - and we were able to snap another picture of the babies getting a little culture while the docents weren't looking (we'd actually been caught the second time we tried to take a picture and asked not too....too bad we don't mind the rules and did it again when they weren't looking). 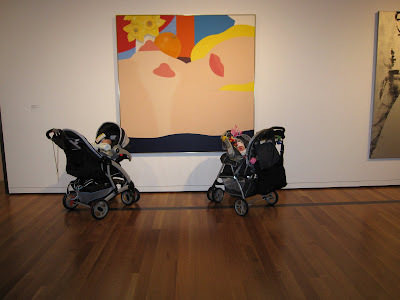 Again, the kids didn't seem too interested in the art, but we thought it was worth commemorating. For those that are history buffs, the musuem currently has a fairly cool special exhibit through the end of May; Life, Liberty, and the Pursuit of Hapiness featuring art from the Yale University Art Gallery. There were some pretty special pieces, including the original piece that is etched on the back of a two dollar bill. How cute is this give away?!?! Grosgrain: Puss Ann Guest GIVEAWAY!!!! My friend Rachel (of Moby wrap guru fame) has inspired me to be more frugal. Actually - I had been thinking of it and she's doing a lot with it, and has great links on her site. ANYWAY - another friend had this link on her site....and free is frugal, so I'm excited to enter this contest: Grosgrain: Born 2 Impress GUEST GIVEAWAY!!!! Today I was reminded how truly blessed I am. I was having one of those days….Madelyn would just *not* sleep – and she didn’t sleep well last night, so I was exhausted to tears. Jim volunteered to take her, but he works nights and he drives a semi. The last thing I need is my beloved driving off the road because I couldn’t hack being a mom. But I was tiiiiired and wondering what the heck I’d gotten myself in to and how I ended up being such a crummy mom that I couldn’t get my baby to sleep. Now, I know you’ll say I’m not a crummy mom – at least I hope you will!!! – but sometimes the heart takes over the head and you’re just convinced that you should know how to take care of your child. People have been telling you that you’re a natural for years – so why can’t you get a grip on things?!?! Then my sister in law Jeni. And she was exactly what I needed. She invited me over to visit with her friend Rachel (http://thewakefieldfamily2000.blogspot.com/2009/03/prayer.html) who taught me a better way to use my Moby wrap – and lo and behold….MADELYN SLEPT!!!!!!! And I realized that I forget the loving support system I have around me…that all I have to do is ask for help and it’s there. And Jeni rocks my world. She’s a great mom and a great friend and if anyone is watching my child and it’s not me, I’m glad it’s her. I love you Jeni – thank you for calling to today. You were my blessing in disguise. And thank you Rachel....you've given me a bit of hope that maybe I can get this Moby thing down! Just another girl trying to make her way through life. What is she talking about?!? !